This is a comprehensive survey of the relationship between film and literature. It looks at the cinematic adaptations of such literary masters as Shakespeare, Henry James, Joseph Conrad and D.H. Lawrence, and considers the contribution to the cinema made by important literary figures as Harold Pinter, James Agree and Graham Greene. Elsewhere, the book draws intriguing analogies between certain literary and film artists, such as Dickens and Chaplin, Ford and Twain, and suggests that such analogies can throw fresh light on the subjects under review. Another chapter considers the film genre of the bio-pic, the numerous cinematic attempts to render in concrete terms the complexities of the literary life, whether the writer be Proust, Joyce, Oscar Wilde, Dashiel Hammett, Agatha Christie or Boris Pasternak. 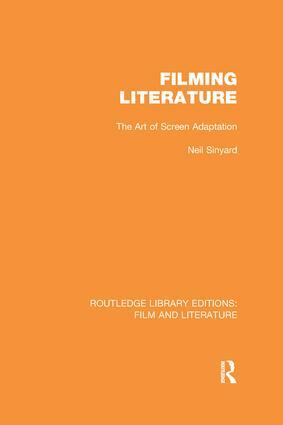 Originally published in 1986, this is a book to appeal to any reader with an interest in film or literature, and is of especial value to those involved in the teaching or study of either subject.